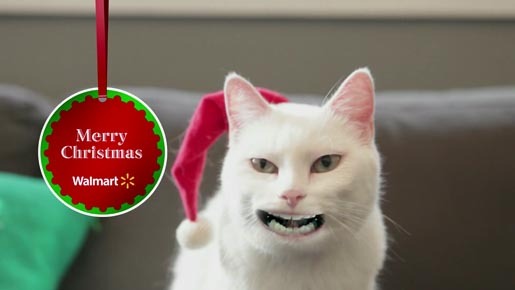 Walmart‘s lead up to Christmas 2011 included a yodeling cat singing “Jingle Bells”. The yodeling cat was made available as a ringtone for iPhone and Android. The Yodeling Cat campaign was developed at The Martin Agency by chief creative officer John Norman, group creative director Joe Alexander, creative Vanessa Fortier, copywriter Bob Meagher, art director Pat Wittich, agency senior producer Pamela Mahan, agency junior producer Ross Skinner, digital producer Lalita Koehler, creative hybrids Chaucer Barnes and Jeremy Lind. Animation was produced at Red Car by creative director/animation director Chris Bialkowski, producer Courtney Fransen, animators Eric Dalimarta and Emil Walter. Music was produced at Comma Music by musician Larry Pecorella and executive producer Bonny Dolan. Audio post production was done at Particle Audio by mixer Dominic Morris.